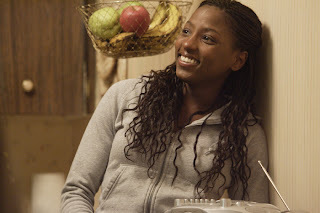 AAEA Hollywood: Rutina Wesley Breaks Through in "True Blood"
According to the HBO website for the show, Rutina Wesley is a classically trained actress who graduated from Julliard, received her BFA from the University of Evansville, attended the Las Vegas Academy of Performing Arts. She also studied Shakespeare at the Royal Academy of Performing Arts. Now she is playing Tara Thornton on HBO's Sunday night flagship show "True Blood." Tara is a quirky character with a southern accent and plenty of attitude. The show is about vampires trying to mix in with human society. Tara is best friends with Sookie Stackhouse, who can read minds and has a crush on a vampire. This is the role of a career for Rutina. It is a breakout role that will hopefully lead to even bigger roles. Tara has a huge crush on Sookie's brother but he seems to sleep with every other woman loose woman in town except Tara. The crush goes back to childhood when he helped protect her from her alcoholic mother. Tara also has a one night stand with her bar owner boss. And this by the 3rd episode.